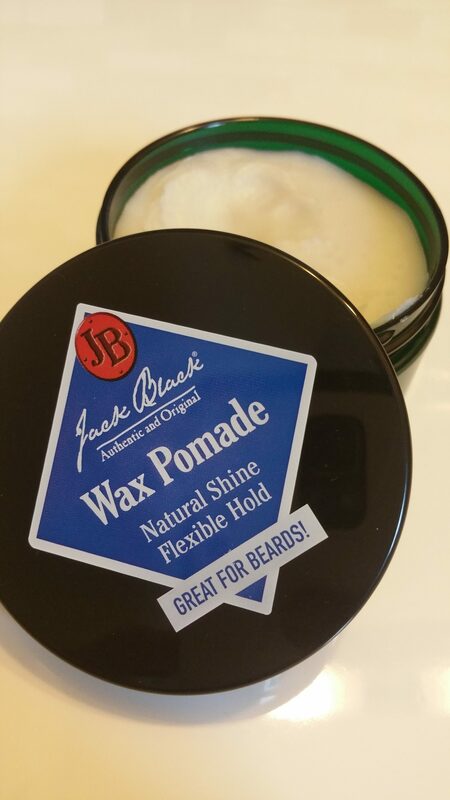 After some weeks of delaying trying this product, I finally tried the “Jack Black Wax Pomade“. The main reason I was delaying this test was because the “Jack Black Pomade” is a wax based products. So far, I haven’t been that impressed with wax as a hair fixative solution. It generally, does the trick on application but falls flat within a few hours. The hair is also left feeling, well, waxy. This product is very expensive in my view at some $28. That being the case, the expectation and rating bar is higher as well. Upon opening the jar, you see a hard waxy substance which takes a few attempts to loosen up and take a hold of with your fingers. Once in your hand it is easy to soften and apply. In fact it is easier to work with than I expected. It takes fairly little of the pomade to get your hair in place. The hold was also a bit of surprise as it lasted more than a few hours. Concerning the end result of the look, it is much softer look than oil or water based pomades. There is some shine to it, but if anything it looks more as if there was no product in the hair, making it a very discreet looking styling solution. Over the course of the day, the product doesn’t break down and feels decent. Obviously, there is a bit of a waxy residue in your hand after touching it, but it is minute.